If you've landed on this page, it means that you are looking out for a suitable accounting software for your own business, or you are in employ and are looking for ways to reduce unnecessary time working on redundant and repetitive tasks. We don't promise that MYOB software will meet every companies' accounting and financial needs, as MYOB is a off-the-shelf software that is catered to the general market. However, our company have served more that 600 companies in Malaysia, of different sizes, business nature and complexity, that we can easily determine whether there is a match. (Note : for interest sake, there are more than 1,000,000 companies worldwide that are registered users of MYOB software, and they cannot be wrong). Our objective here is to find ways how YOU and US can work together with the help of MYOB software, to run your business efficiently and profitability. Do I need an accounting software if my business is 'small', or if I don't have a full time accounts staff in my employ? YES. If you want your business to turn in profits, you should use an accounting package in your office premises. No two ways about it. Whether you run a small SOHO business, or a big business with international links, you will need a system to record your business transactions. Why do the things that a computer can do better? Modern day accounting software can ease the workload of all the business operations departments in your company, such as purchasing, order taking, receiving, customer service, warehouse, marketing, and not forgeting the accounts and finance department. We are of the opinion that every business should have an in-house accounting software, even if there is no professionally trained accounts personnel in their employ. Running a business without an accounting software is like driving a car blindfold. You don't know how much sales you've done, how much profits (or losses) you've made, how much expenses you've incurred, how much are owing by your customers, how much you owe the suppliers, how much taxes you need to pay and so on. If you are still doing your accounts manually, or outsourcing the accounts to a thrid party, you may have missed out many business opportunities. 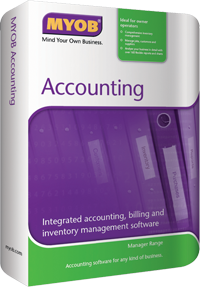 So, what is MYOB accounting software? MYOB Accounting software is a business management software with features that encompass the entire business operations of a growing business entity. After you install the business software on your PC (or Mac) it can help you automate the processing, recording, and storage of business financial transactions. Operational transactions such as ordering and receiving goods, taking customer orders, tracking the orders, and fulfilling the orders and taking stock of your inventory are handled well in MYOB Accounting software. Besides that, MYOB Accounting software is also capable of handling the traditional accounting functions such as billing and invoicing customers, recording the amounts owing by customers, tracking payment due dates and recording payments received. On the suppliers side, MYOB software will help you track the bills and payments due, and record the payments when made. The operational transactions and the accounting transactions are treated as integrated transactions in MYOB Software. It is therefore possible to print the financial statements at any time of the year. This means you get financial information on demand. At a click of the mouse, you will be able to generate the General Ledger, from where the Financial Statements are generated automatically. The Balance Sheet will give an indication of the amount of stocks held, the amount of sales (and profit) not collected from customers, and the amount of fixed assets that are used to run the business. You can print all documents that you need from the MYOB Accounting software - this includes quotation, delivery order, packing list, invoice, address label, purchase order, goods received note, credit note, debit note, statement, payment voucher, official receipts, and even cheques. The documents can be emailed to your recipients to save printing costs. How can the use of MYOB Accounting software increase my cashflows? 1. MYOB software is an integrated system. It integates supply chain with the inventory management, and the sales ordering system. This means that you will be able to accurately determine the inventory requirements, so that you can maintain sufficient stock levels. You will not fall into the trap of insufficient stock levels, or an overstocked situation, both of which have financial implications to the company's cashflow. 2. In addition, since the operations function is integrated with the accounting functions, it eliminates duplication of work. The Accounting Department continues from where the operations department stopped. As a company on the whole, there is a marked reduction of time (and money) spent on otherwise duplicated work, which translates to savings in thousands of man-hours and overtime payments. 3. The debtors aging report shows the number of days of outstanding debts. Use this report to understand how and why the debt exists, and use it as a great tool to accelerate the collection of your debts, and reduce the impact of negative cashflows. 4. Figures don't lie. They tell a story. Inventories are the hardest to keep track of. If you don't have a system to track the movement of the inventory quantity and cost, you will not know whether you have too much or too little of the inventories to run your business. One client realised that he has close to Rm 2 million in the form of unsold inventory when we completed the first month's balance sheet. The inventories consists of small parts which were kept in cabinets and drawers in several parts of the warehouse. It did not 'look' a lot to the naked eye, but adds up to a lot in purchase value. And because they didn't have a record of the purchases, they have many duplicate inventory items in different locations. The clients who benefit most from our services are those who take on our complete implementation package. This package is a value package where we will conduct a business process audit to help us identify the areas that should be part of the financial reporting system. When we sign off from the project, you will have a system that is ready to provide the financial figures at a click of a mouse. If you have an accounting personnel on board, we will work closely with the accounting personnel to implement the solution. Otherwise, we do offer part time accounting services to get you started until you find the appropriate person to take over. How can we (YOU, Us, MYOB) work together? Talk to us, and we will analyse whether we have a business match. MYOB software is just a tool, which will be handy if you know what to do with it. We are the experts who can make the tool into a workable solution for you.